Mustang's advanced comfort technology has been incorporated into this totally new style of custom seat. Ride low, look cool and still be comfortable at the end of the day's ride. The detailed stitch work in the highly durable, synthetic glove-leather cover makes the DayTripper™ a real show winner. 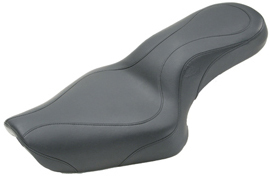 Never before has such a low and lean seat been available that feels this good for both the rider and the passenger.